HideaBench folds up and flat to the wall when not in use! You'll love the high quality seating that HideaBench offers. Forget about setting up folding chairs forever! Get rid of those annoying folding chairs in your gym and clean up its appearance with a new Hide A Bench. Hideabench is perfect for elementary schools, middle schools, churches, recreation centers, any place where space is premium. Hideabench safely and permanently attaches to almost any wall and extends less than 6 inches from the wall when folded up and can be setup for use in less than a minute by one person. Hideabench your space saving seating solution. You can also match your facilities color scheme with adding one of our four powder coating color selections or make your Hide-A-Bench a more comfortable seating solution by adding our integrated seat pads to your order. 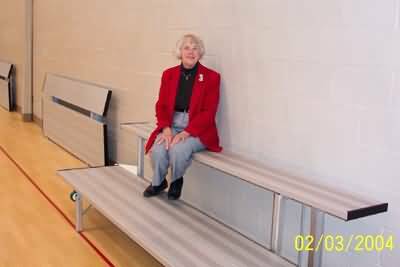 The Hide-A-Bench cannot be customized, it is only available in sizes shown in the charts below. The Hide-A-Bench provide a safe. durable, comfortable alternative to folding chairs on your gym floor. Easy to setup and fold nearly flat to the wall when not needed!